Συσκευή αυτόματης τιτλοδότησης (Automatic Titrator) Υπάρχει 1 προϊόν. 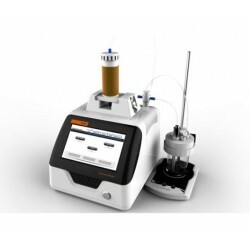 Automatic Titrator is a lab titration device with high analysis accuracy under the principle of potentiometric titration. The titration methods include macro titration, micro titration, volume setting titration, EP, etc. It enjoys modular design, consist of three parts: volume titration device, control device and measuring device.